"women take more pains with their chili cooking than the men do"
Chili cooking is mostly thought of as "man's work". We have the image of the old cowboy hunkered down by the campfire with the black pot hanging over the coals. I recently attended the Texas Ladies State Chili Championship contest in Blanco, Texas. I was asked to be one of the finals judges for the chili. This was the 40th edition of the Ladies State Championship. It started in Luckenbach, Texas with Hondo Crouch's "Ladies Chili Bust". Several years ago, the contest outgrew Luckenbach and moved to the Star Ranch near Blanco, Texas. This year it was in Yett Park in Blanco. A seldom seen fact is that in October 1952, at the Texas State Fair, Mrs. F.G. Ventura of Dallas, Texas won the first chili cooking of any kind anywhere. Before Mrs. Ventura, women were responsible for chili becoming a favorite dish worldwide. The Chili Queens of San Antonio, in the late 1800's and early 1900's had open air stands in the plaza in San Antonio. Their operation offered chili to local citizens and travelers from all over. In 1974, Allegani Jani Schofield won the world famous chili cook-off at Terlingua opening the way for women to be treated as equals at the chili competitions. Our modern day "Queen of Chili" is Dorene Ritchey of Garland, Texas. Dorene has won the Texas Ladies State Championship twice and the World Championship at Terlingua 4 times. The judging at Blanco went very well. Across the table from me sat the afore mentioned Allegani Jani Schofield and Ms Jo Anny Horton. Both of these ladies were a part of the founding of the "Chili Madness" in the world's first "Chili Pod" (club) in Houston in the early 1970's. I think the women take more pains with their chili cooking than the men do. They are forever stirring, tasting and adding things to their chili pot. The men just sort of get the pot going and have a beer. Our modern day Queen of Chili is Dorene Ritchey of Garland, Texas. The chili at Blanco was above average. In fact it was one of the better overall turn-ins that I have sat in on in a long time. The judges are furnished a score sheet, a pencil, crackers, cheese and celery to cleanse their taste buds between chilis and a beverage to get the taste of the crackers, cheese and celery out of their mouth. One concession to political correctness and sanitation is that plastic spoons are furnished for the judges. You cannot "Double dip" if you want more than one spoonful of chili you have to get a new spoon. The spoon manufacturing industry has grown 57% since the chili cook-offs started using this feature. You also cannot wear tinted glasses or shades during judging and your ability to detect the proper shade of Texas Red may be impaired. I have been around the chili cook-offs for 38 years and I have never seen any chili that was actually red. There has been some spaghetti sauce entered as chili that was pretty close to being red. 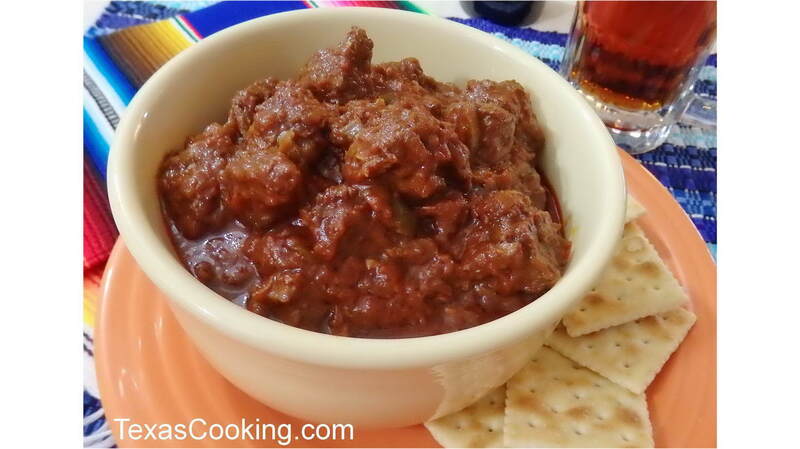 Here is a winning recipe from the "Queen of Chili"
Cook meat over medium heat in melted shortening until meat is gray. Add hot sauce, tomato sauce, bouillon cubes, 1 jalapeño and water to cover. Simmer, covered, 40 to 60 minutes, stirring occasionally. Add water if needed. When jalapeño is soft, squeeze in the juice and discard pulp and seeds. Mix together the chili powder, cumin, onion powder, garlic powder, salt, white pepper, cayenne, oregano and bay leaf; divide into 3 portions. Add one portion spice mixture and remaining jalapeño to chili. Continue to cook, covered, for 1 hour, adding water as needed. Remove jalapeño, squeeze juice into chili and discard pulp and seeds. Add second portion of spice mixture. Continue cooking for another 30 minutes, adding water if needed. I hope everyone out there in Texas Cooking land has a great Thanksgiving. You can go back in my elderly columns and find everything you need to know about toasting the turkey and what to do with the leftovers. I'll see all of you again next month.